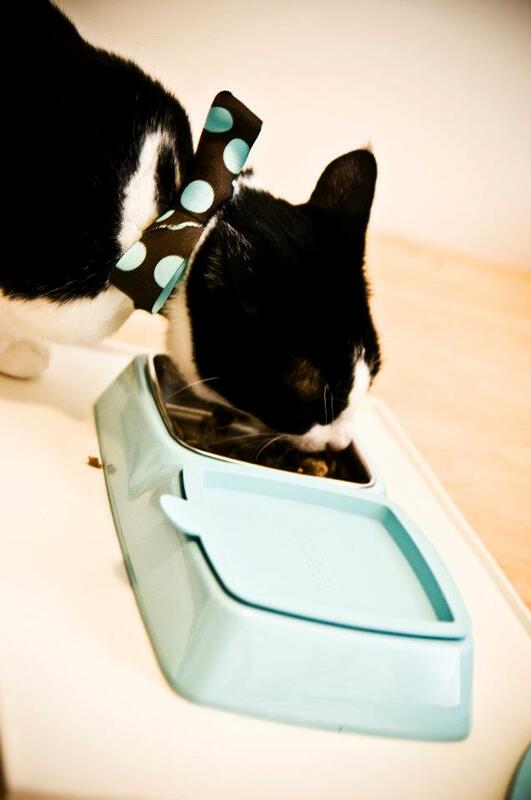 Jessica Hodgson, the winner of last month's PetSmart contest, sent in this photo of her cat Koah enjoying her new Martha Stewart Pets double feeder and feeding mat from PetSmart. Jessica told us about Koah's story and we loved how devoted she was to this special feline, which is why we chose her as the winner. Koah was rescued from the streets of Daegu in South Korea while Jessica was travelling there. Jessica made all the arrangements to have her brought back to Canada to live with her. Jessie says she loves the bowl because when her other cat, Neko, is finished with his side of the feeder, she can put the lid on it to keep it fresh. It also keeps Koah from eating the rest of Neko's food! For the photo, Jessie dressed Koah in the little polka-dot bow that wrapped the package when it arrived in the mail. So cute!